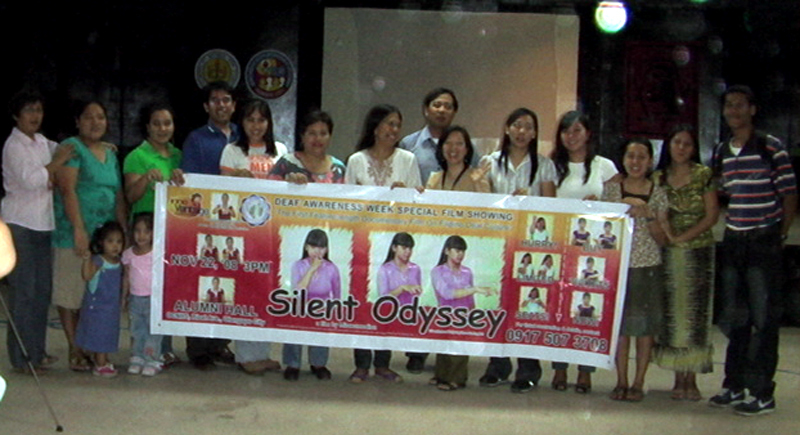 Silent Odyssey’s first out-of-town journey was held at Rene M. Medina Hall in Dolores, San Fernando City. It was sponsored by the Values Education Department of Pampanga High School (PHS) and supported by PHS Batch ’79. 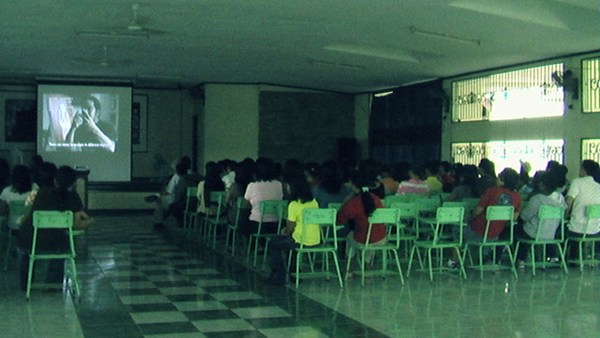 The screening was part of the seminar intended for the special education and values teachers of the school. 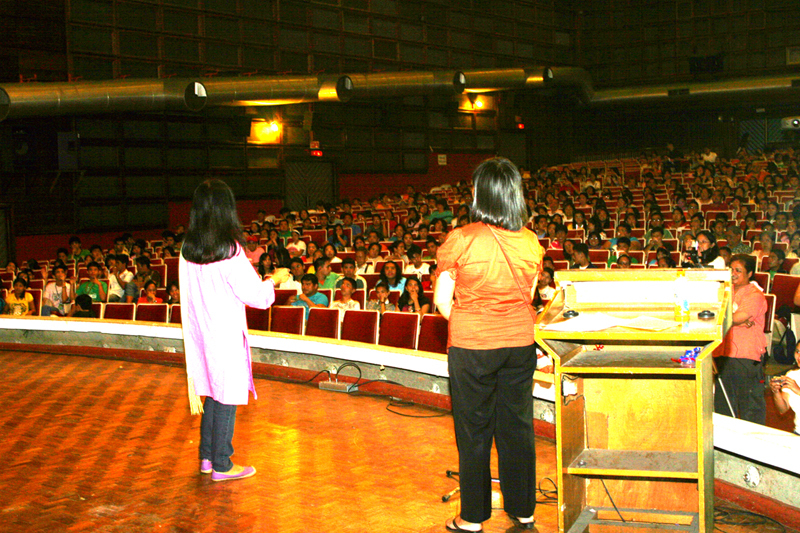 It was spearheaded by Ms. Jean Canlas, OIC, Values Education Department and the school principal, Dr. Imelda Macaspac. It was a very rainy day but the bad weather had not been a deterrent to more than 100 people who attended the screening. Nearly half of the viewers consisted of Deaf students and some parents who came in trickles until the screening started at 10 am. Pastor Cesar Castro, his wife and Pastor Andy, friends of Philippine Federation of the Deaf (PFD) President Racquel Corpus also came. Interestingly, some passers by dropped in to watch the film. During the screening, a few could be seen wiping their tears—of joy probably—for seeing the potentials of the Deaf and that they can really be at par with the hearing. The case of Isagani Sta. Ana who is Deaf but married to Sarah, a hearing person never fails to inspire the viewers. The public declaration of Sarah’s love to her Deaf husband pinches the audience’s heart whether they are Deaf or hearing. “Very touching,” texted Atty. Robert Sison who viewed the film during its premiere at the UP Film Center last September 20 . After the viewing, having learned from the Deaf themselves in the film that labels as “pipi,” “deaf-dumb,” “Deaf-mute,” and “HI” or “Hearing-impaired” hurt and offend them, the use of the word “Hearing-impaired” noticeably lessened, if not, died down. (In the preceding activity before SO’s projection, the word was used more than 10 times). 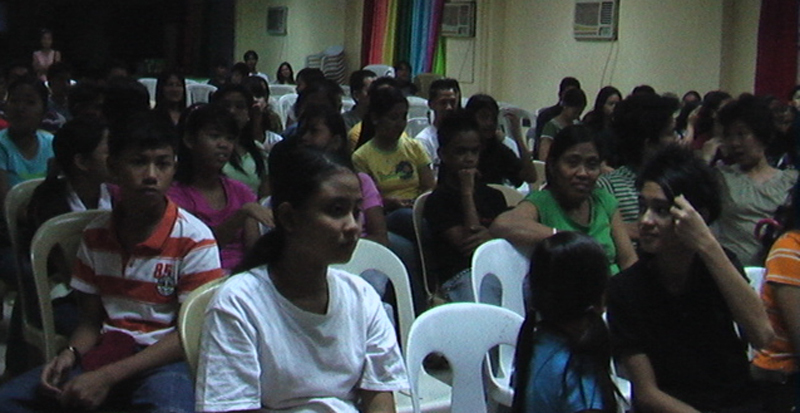 Questions on the Filipino Sign Language (FSL) issue also came up but as Bible Institute of the Deaf (BID) President Rev. Elena Castillo pointed out the use of sign language depends on what can actually be effectively understood by the Deaf. Irrespective of the sign language being used, what is most important is communication. In the afternoon, Rev. Elena Castillo, guest speaker for the day introduced an educational approach called Pattern Language (PL) which would help address the retention problem which appears to be common to Deaf students as experienced by the majority of sped teachers for the Deaf. Although the day started with gray and gloomy skies for the seminar participants, the day ended literally bright as the sun shone with hopeful and indeed happy hearts for learning from Sister Ellen her actual experiences and knowledge in guiding Deaf persons whom she has always considered as “children of God” and for whom she has devoted her life. 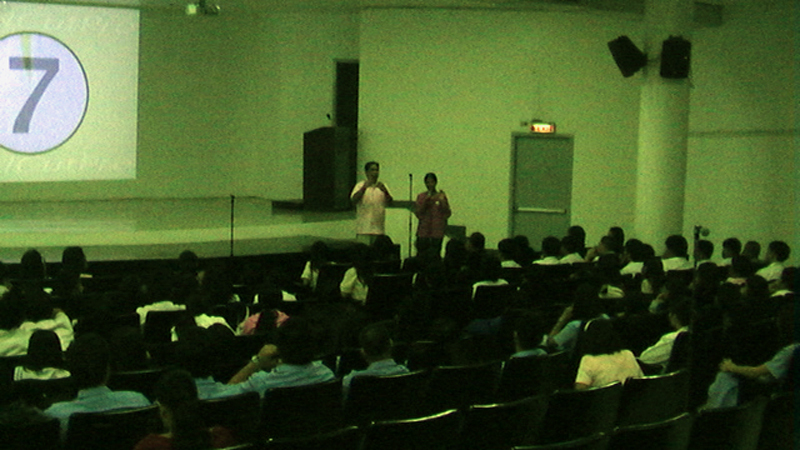 The screening held at Paz Adriano Building’s Mini-Theater was part of Deaf Awareness Week 2008 and was sponsored by Miriam College-Southeast Asian Institute for the Deaf (SAID). Ms. Carol Ui, the school principal initiated the showing of SO. After the screening, Link Consultant Dr. Robert Mobley expressed his opposition on the idea of the use of the words “natural sign language” to mean that of “native or indigenous sign language.” Seen on the context that Signing Exact English (SEE) is considered as an “artificial” language however, sign languages, i.e. American Sign Language, Japanese Sign Language, etc. are considered “natural.” However, the new perspective he gave me that sign language being an acquired language just like any other language and therefore can not be considered as natural language is something I am so appreciative about. I am very happy to know more and more angles as I go around with SO. It means that my journey into the Deaf world has not stopped after making the film. Both Deaf and other hearing viewers acknowledged being moved by SO. It is truly encouraging to know that my objective of empowering some of the Deaf is being realized. Coinciding with the end of SDEAS’ 14th Deaf Festival was SO’s showing at Olongapo City National High School (OCNHS). Deaf students, hearing teachers, students from some colleges, parents of Deaf, members of Jehovah’s Witness came to attend the screening. The organizers composed of teachers from the host school, OCNHS, Innovantage Learning Center and some Deaf youth worked well together to have a successful showing. Johnny Boy Recella emceed the event with Charmaine Gutierrez (Deaf). Ms. Liza Presnillo later interpreted for me as I introduced the film. I only wished that discussions after the film showing was done to help process the minds of the viewers especially of the Deaf as there could have been probable confusion in their minds having been presented with issues which could be totally new to their knowledge. Group picture taking closed the event. First shown in the Visayas, the three screenings of Silent Odyssey by GPRehab through the initiative of Analou Suan, its Executive Director was held at Bethel Guest House located along Bay Boulevard. The enthusiasm of hearing students and faculty members who came and stayed through to the end of the film and who expressed their desire to study sign language was overwhelmingly surprising. With the interest in the hearing audience seemingly sparked to study sign language, the need for its teaching becomes apparent and a necessity. Happily, only two days after the screening GPRehab informed me that they met with the Deaf group led by Jessie Flores and together they came up with an idea to start an awareness raising project called “Bridging the Gap” where the Deaf would offer free sign language classes to schools interested to support the endeavor. I hope that the project takes off soon so that their inclusion in the society becomes faster. The time is now! !